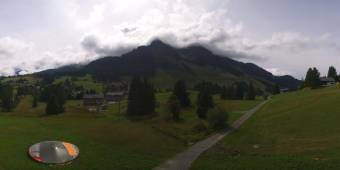 It's 11:06 in Les Mosses, Switzerland right now. Ormont-Dessus: roundshot 360° Panorama Les Mazots, 4.1 miles away. Leysin: Chalet Sybil, 5.6 miles away. Leysin: roundshot 360° Panorama Kuklos, 5.6 miles away. Château-d'Oex: roundshot 360° Panorama, 5.7 miles away. Château-d'Oex: 360° Panorama La Braye, 5.7 miles away. Scex Rouge: 360° Panorama Glacier3000, 6.8 miles away. Villars-sur-Ollon: roundshot 360° Panorama Chaux Ronde, 7 miles away. Villars-sur-Ollon: 360° Panorama Villars, 7 miles away.